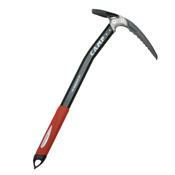 The Camp Alpax Special blurs the lines between an ice tool and a mountaineering axe to let you take on steep ice as easily as a snowy summit ridge. Thanks to its reverse-curved pick and slightly bent shaft, the Camp Alpax clears ice bulges with ease. The bottom pommel lets you run leashless on the steep stuff, and it stows in its own handle to let you plunge the tool in the snow.